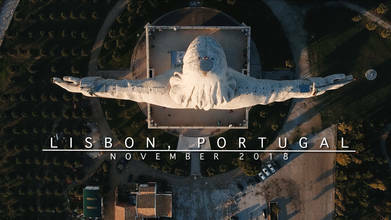 Prepare to be blown away by this incredible drone video of the great Portuguese city of Lisbon, compliments of contributor p3c0. The video leads off with some epic overhead footage of the Christ the King (Santuário de Cristo Rei) monument overlooking the city, its most recognized landmark and one of the most well known statues in the world. Completed in 1959, it was inspired by a similar statue in Rio de Janeiro and was built to express national gratitude for avoiding the horrors of World War II. Description: I have been Lisbon WALKER for 3 days and captured this shots to make memories and share it with you. I have used Sony a6300 with SIGMA 30mm 1.4 lens and DJI Phantom 3 standard to capture SUNSET drone shots of Jesus statue. Waiting for sunset is element for me to achieve better result and I hope you will enjoy it as well.